The article specifies that intensive development of the economy can be achieved by attracting and effectively using investment resources. Based on the indicator of the level of investment sufficiency, it was established that, in the period under review, the level of investment adequacy in the country is less than the established ‘threshold’ value, which indicates a shortage of investment funds. 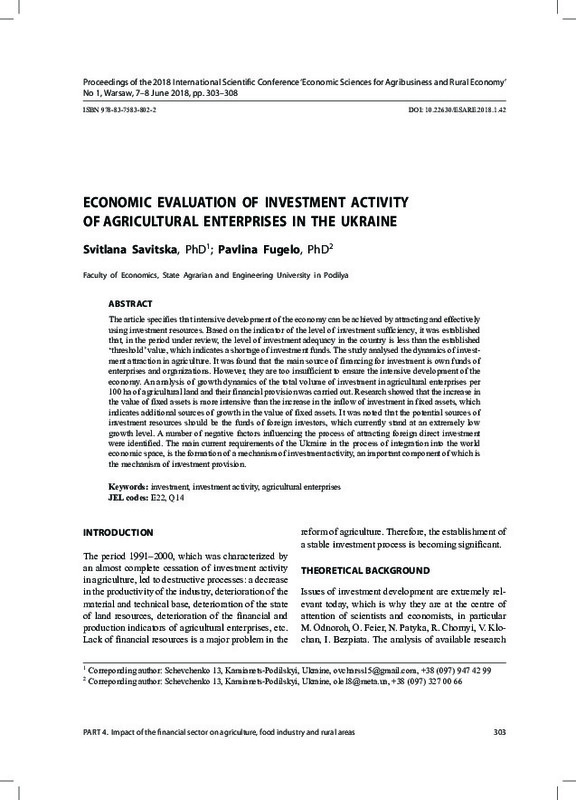 The study analysed the dynamics of investment attraction in agriculture. It was found that the main source of financing for investment is own funds of enterprises and organizations. However, they are too insufficient to ensure the intensive development of the economy. An analysis of growth dynamics of the total volume of investment in agricultural enterprises per 100 ha of agricultural land and their financial provision was carried out. Research showed that the increase in the value of fixed assets is more intensive than the increase in the inflow of investment in fixed assets, which indicates additional sources of growth in the value of fixed assets. It was noted that the potential sources of investment resources should be the funds of foreign investors, which currently stand at an extremely low growth level. A number of negative factors influencing the process of attracting foreign direct investment were identified. The main current requirements of the Ukraine in the process of integration into the world economic space, is the formation of a mechanism of investment activity, an important component of which is the mechanism of investment provision.